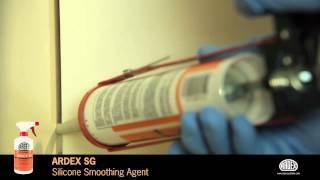 ARDEX SG is a smoothing agent used with ARDEX silicone sealants. It prevents the silicone from sticking to tools and other surfaces, and helps to achieve smooth professionally finished silicone joints. ARDEX SG is compatible with ARDEX silicones. Do not apply to joints that are yet to be filled with silicone as it will prevent adhesion. Avoid application on porous tiles and natural stones, as these may stain.